We finally kick start our Royal Belum – Temenggor Tour in 2018 with our dear friend Scott Bremner. 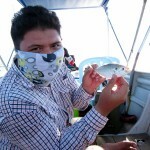 Through out the year, FEB to APR is probably the best time to experience fishing in Belum-Temenggor lake. The water level is quite high, submerging most of the vegetation along the lake banks. Providing more extra cover for small bait fish, which eventually will be hunted down by Temenggor top predatory game fish. Picked up Scott around 10.30pm at KLIA. We drive up to Pulau Banding main jetty. It took us about 6 hours to reach our location. Couldn’t remember half of the journey haha. We arrived safely and utilize the time we had left for our night sleep. First day turns out to be a Sebarau day. We had a great morning session to warm us up for the big game. Most of the Sebarau concentrated in Sg Gadong at the moment. Common 7g spoon, silver and bronze does the trick here. Cast and retrieve. What captures my attention was some rises indicates there is some big Sebarau. One of the local boatman told me that he lost 3 Rapala TDD-9, thanks to the awesome power of a Sebarau. We did some trolling back and forth the river but no luck. We stayed on until half day before crossing over to Royal Belum to visit Sungai Kenarong. First Sebarau of the year! Not a bad size to start your day. 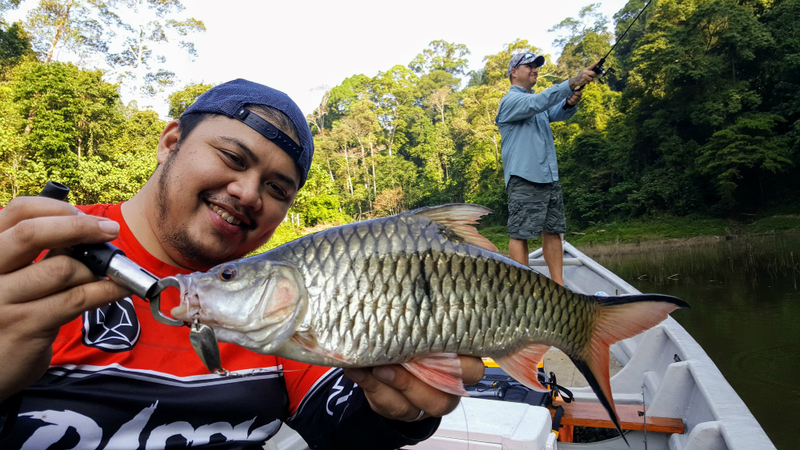 One of Malaysia's best Freshwater Game Fish! More Sebarau, 9 to fish in the morning, all safely catch and release! 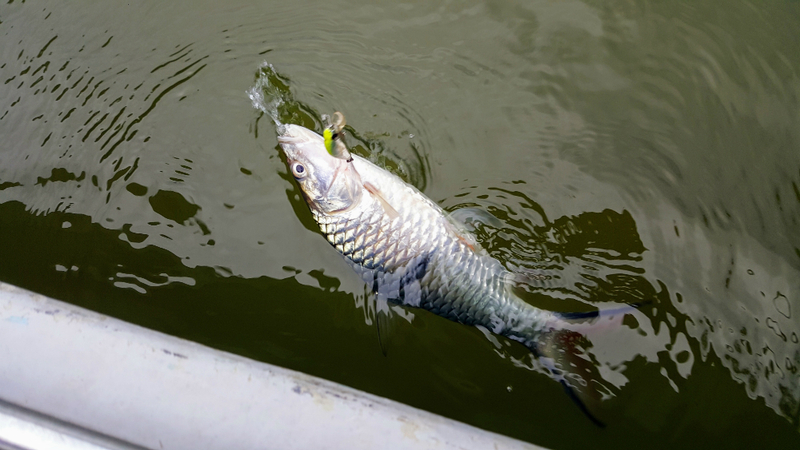 We reach Sungai Kenarong but the water condition hampers our hope for great fishing. It was too murky and the water level dropped beyond our expectation for April. We stayed on and tried several location outside Sungai Kenarong. Skunked! Nothing over Royal Belum. I guess the water was lowering all the time, the fish somehow need to readjust their location as most of their usual hiding ground is above the water. 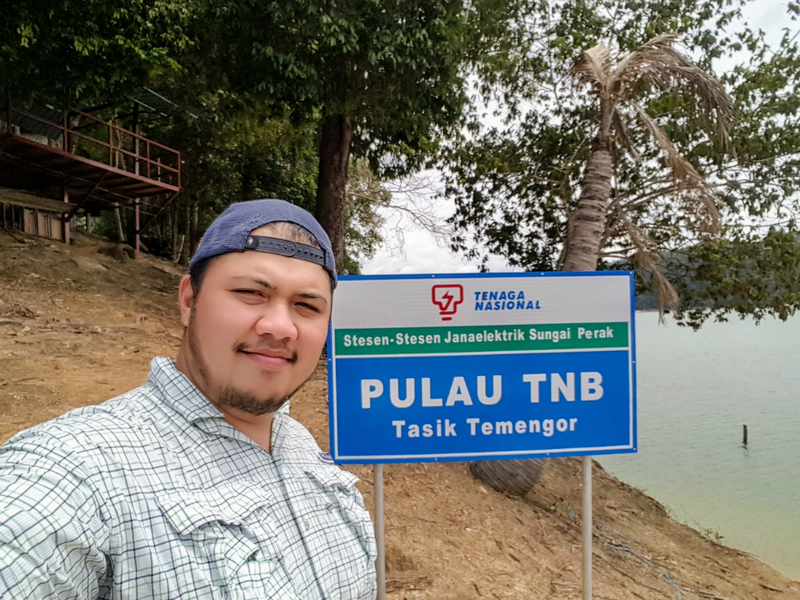 Forcing us to explore Southern Section over the next 2 days of fishing in Tasik Temenggor. Day 2 has taken us south in Temenggor. Exploring several small bay along the vast lake. Wanted to stop over at the Tilapia farm for some quick action but now it was heavily guarded by the farm operator. We pressed on until we reach one particular spot. The ambiance was cool, lush green and the water was so calm and quite. 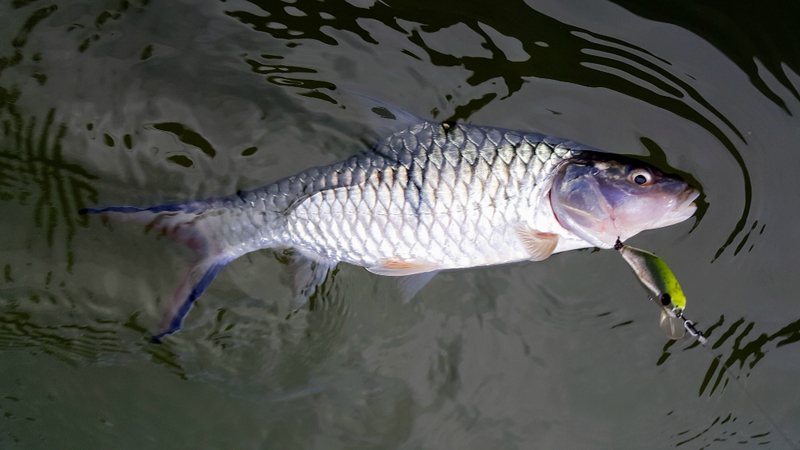 We could clearly hear if a fish surfaces for air. 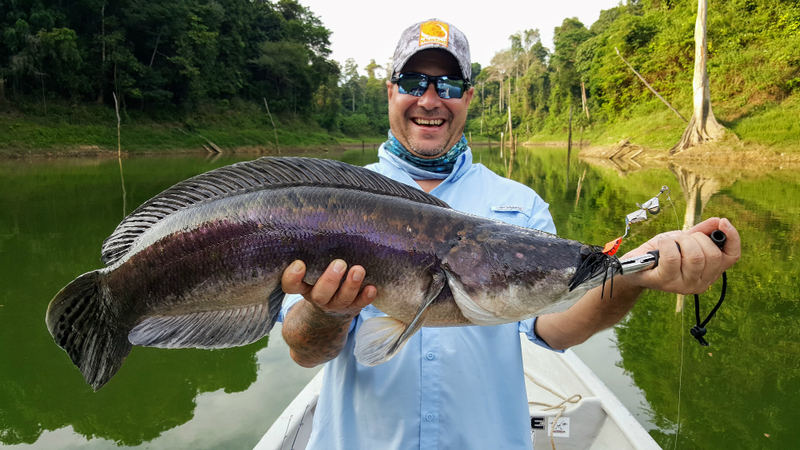 Toman or Giant Snakehead surfaces for air occasionally and with that particular habit, we could now pinpoint their location and cast our lure. Over a shallow bank, a Toman surfaces for air and it stayed close to the bank hoping to ambush any bait fish passing by. We are still about 50m away and slowly the boat creep closer to our target area. This is an important moment. Most angler would rushed cast out the lure to make sure they had the first chance to catch it. Wrong move. Usually you will end up with a birdness because the angler pushed it, spooking the fish and eliminating your opportunity. Thanks to my countless experience, I told Scott to wait and cast when you have the best shot. I crank up the pressure a little bit more by stating that he only had one shot. Toman will only took the lure once for Topwater and if you miss, then you miss. It was closer now about 20m. I knew he had the range, he was on a buzzbait. He made the cast, it landed along the banks and above an underwater structure. Perfect spot. Cranked the lure as steady as possible, not too fast not too slow. Capturing the Toman attention, annoyed it with the loud sound of propeller hitting the metal tip. No strike, second cast, 2 ft away from the bank. BOOM! The fish took it! Scott has been FW fishing in Thailand for about a year. I can clearly see he has the composure to hooked the fish properly and Taichi his way with this monster Toman. 10-20lb Kenny Chee made rod stood up the fight. The Toman dived deep into the structure but Scott’s Revo Black was able to pull it out not once but twice. It stayed down putting pressure, but after two unsuccessful dive I knew he was able to subdue the monster Toman. Personal best for Scott! 18lb Toman or Giant Snakehead of Tasik Temenggor. Super catch! It was massive when I lifted it up the boat. Awesome feeling, Scott was dancing on the boat after breaking his 5kg Toman 2 years ago. A great start to our second day. Unfortunately the second half was again quite. We stopped by TNB Island for our lunch break. I took the boat out roaming around the Island after our lunch. Scott almost hooked on a Giant Gourami. It was checking out Drave Gurerro topwater lure, following it close the boat. Could have been a special species if it took the lure. While we were busy buzz baiting along the bank, a Toman strikes a random bait fish just right after Scott’s buzz bait pass by. Unlucky! It was a thunderous strike, too bad could have been no 2 for Scott. Third day was even tougher, we did catch some Sebarau during the morning but towards the end, it was zero all the way. Overall it was still a great outing in Tasik Temenggor, Perak. We wish we were catching fish all the time, breaking personal record all the time. That scenario does not happen all the time, that what makes fishing special. We savor the best moment and try again and never gave up during tough day. Thank you Scott, you’ve sort of like reignite my passion. You have given me a great reminder why I shouldn’t give up this wonderful site. A site that has been a collection of all great memories that I have personally experience with all my friends and fans. It has been a slow start to 2018 but we will come back strong this year. Stay tune for more!!! !